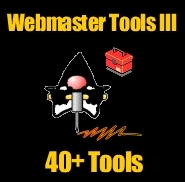 Webmaster Tools III... is the best application of it's type available on the internet today. Webmaster Tools was designed and developed with webmasters in mind. A library of codes that will enable you to print special characters to the screen. Some of these characters.